Creationists invent their own mutation rate! 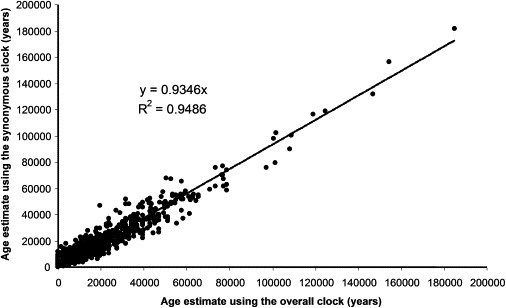 In September 2015 young earth creationist Dr Nathaniel Jeanson published a study attempting to show that molecular clocks and the mutation rate support the young earth creation narrative. This was followed up by another study in April 2016. The molecular clock uses the mutation rate of DNA to deduce the time that has passed since different life forms diverged. It operates under the assumption that mutations to some parts of the genome happen like clockwork. This presents a particular problem for young earth creationists because there is a lot of genetic diversity present within modern species. This diversity, in the absence of hyper-mutation, must have taken hundreds of thousands of years to evolve. The molecular clock works by counting up the number differences between two individuals. If we know the rate of change it becomes possible to work out how many generations it took for these differences to accumulate. Then we can also infer how long since these two lineages stemmed from a common origin. This has been used to investigate a number of important issues such as the date of divergence between modern humans and Neanderthals. To give an illustration of how this works, let’s say you were to meet a stranger and compare your Y-Chromosomes. You find that there are 12 differences that separate you. This would imply that on average each of your patrilineal lineages have undergone 6 changes since the time that you last shared a common patrilineal ancestor. 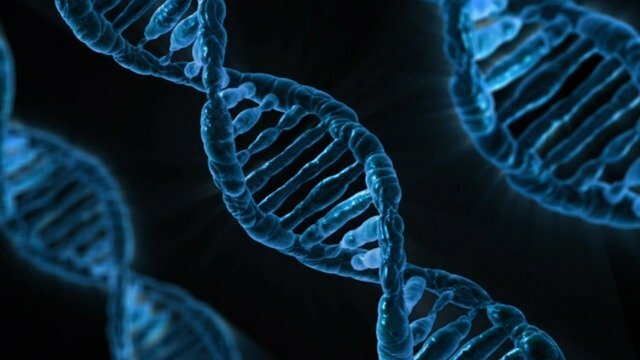 You could now look up the mutation rate for the human Y-Chromosome (about 1.8 new mutations each generation) and you would find that you are probably second cousins. You share a common patrilineal ancestor going back 3 generations. 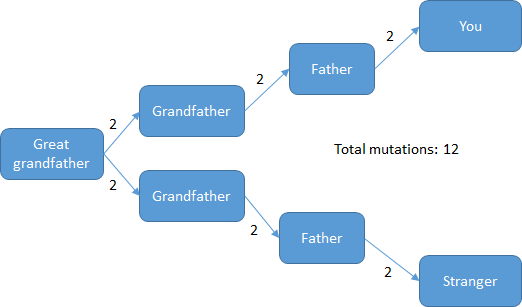 6 mutations on each lineage (12 total separating you) indicates that you share a great grandfather. This technique can also be done using female ancestors and mitochondrial DNA. The mutation rate will be different but the principal is the same. If we were to find the two most different humans alive today and count up the differences in mitochondrial DNA between them, we should be able to calculate the amount of time that has passed since they last shared a common matrilineal ancestor – commonly called mitochondrial eve. This is what Jeanson attempted to do in his most recent study. He referenced a paper from 2013 which looked at 7098 mitochondrial genomes. The authors of this paper found that the two most different people in their dataset – who were both of African descent – had 123 differences between them. The next closest pair consisted of an African and a European individual who had 122 differences between them. Jeanson then took this maximum genetic distance (123) and a mitochondrial mutation rate which he had manufactured in his previous 2015 study. Based on this he concluded that these individuals could only be separated by a few thousand years at most. A figure conveniently conforming to AIG’s belief that women were created from a rib in 4004 BC. The problem lay with his mutation rate. It was wrong – horribly wrong. The mutation rate he used was 0.197 mutations per generation. Assuming a generation time of 20 years and given that the mitochondrial genome is 16,569 nucleotides in length, this works out to a mutation rate of 5.94 x 10-7 mutations per nucleotide per year. Or to put it another way, a new mitochondrial mutation every 100 years. So how does this compare with the widely accepted mutation rate for the mitochondrial genome in humans? Yielding an age of modern human expansion in the Americas at ∼15 kya, consistent with the archaeology. Accurately predicting the timing of the first modern human settlement of Europe and resettlement after the Last Glacial Maximum. Not only did it agree well with the archaeological evidence, but when they compared their mutation rate to a rate based on looking at just synonymous mutations, they found it to be accurate. Yet Jeanson was using a mutation rate which was 35 times greater than this observed value! How did he come up with a mutation rate so wildly different from the measured results published in scientific literature? The manufacture of his mutation rate goes back to the original study, Jeanson 2015b, where he calculated it. He consulted 3 studies which looked at differences in mitochondrial DNA between mothers and children. By grouping all of this data together, if he could divide the total number of changes that had been detected in one generation by the total number of mother and child pairs he could come up with a figure for the average number of mutation that happen in each generation. Two of the studies he referenced were small and found no differences. Nevertheless Jeanson added these to his overall result which had the effect of diminishing his mutation rate. By adding null results from small studies like this he could effectively fine tune his mutation rate. Add a study with no detected changes and you can reduce your mutation rate or simply remove a study with no detected changes to increase it again. The third study (Ding et al 2015) did purport to find differences (63 differences between mother and child for 333 pedigrees) and so this is the study we will need to look at. It becomes necessary at this point to briefly explain the difference between homoplasmic and heteroplasmic mutations. Each cell within our body contains a single nuclear genome (the genome that lies within our nucleus) at the same time, each cell within our bodies contains many hundreds of mitochondria and so it is possible for a cell to have many hundreds of copies of its mitochondrial genome – not only that but if you have a mutation in your mitochondrial genome it is possible for that mutation to be in some of your mitochondria but not in others. This is known as a heteroplasmy. The opposite of this: where all of your mitochondria agree on the DNA letter at a given position is known as a homoplasmy. For example if 100% of the bases at position 10,564 are the letter C then that base is homoplasmic. If 60% of the bases at that position are the letter C and 40% are the letter A then that base is heteroplasmic. The Ding study looked at mitochondria from somatic cells (lymphocytes). 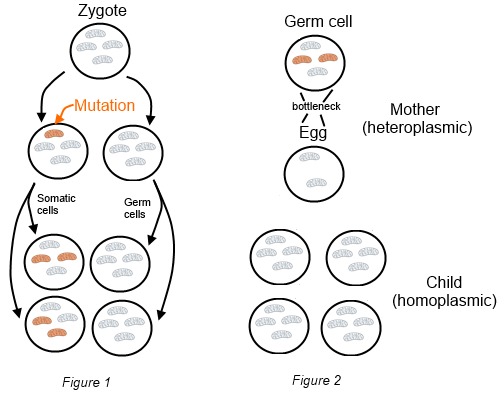 Typically somatic cells undergo many more divisions than germ cells and so are more likely to contain a heteroplasmy as the chance for a new mutation increases with each division of a mitochondrion. It is possible for somatic cells like lymphocytes to have heteroplasmies even though these were not inherited from the mother and will not be passed on to future generations. Figure 1: It is possible for a woman to have a heteroplasmy in her lymphocytes even though she does not have a heteroplasmy in her germ cells (cells that will go on to produce eggs) and so she will not pass on a heteroplasmy to her children. The same applies to her children – detecting a heteroplasmy in lymphocytes does not necessarily imply that this state was inherited. Children on the other hand are more likely to inherit a homoplasy from their mothers due to a mitochondrial bottleneck in the germ-line even if mothers are heteroplasmic. Jeanson used the Ding study and then picked the table shown below to provide him with data to create his mutation rate. If you look at the table carefully you will see that it uses data from 333 children along with their 333 mothers. 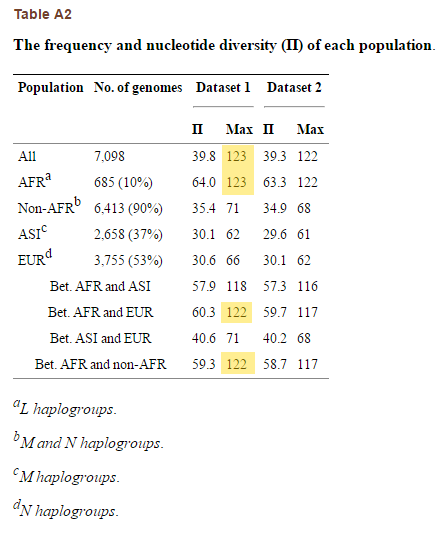 The study compared sequences from these individuals with a reference genome called rCRS (The Revised Cambridge reference sequence) The rCRS belongs to a European of haplogroup H2a2a1. A variant here is any nucleotide position which varies from the reference genome. As you can tell from the table, a variant can be a homoplasmy or a heteroplasmy. Jeanson concluded from this that there were 35 variants found in children but not found in mothers and 28 variants in mothers not found in children (together these add to 63). At first this seems reasonable until you consider the fact that this line was specifically excluding heteroplasmies. It is possible that those 35 homoplasmic variants in children already existed as mutations in mothers but in mothers they were heteroplasmic variants. Jeanson would have counted these as germline line mutations when the reality is that they weren’t. This can happen through mitochondrial bottlenecking (Figure 2) or it could happen through a later mutation in the somatic cells of the mothers (Figure 1). It is also possible that the 28 homoplasmic variants found in mothers had become heteroplasmic in their children because of later mutations that had happened in the child’s somatic cells, giving rise to heteroplasmies in their lymphocytes even though they didn’t inherit these from their mother and wouldn’t pass these on to offspring (Figure 1). As above, Jeanson would have counted these as genuine germline mutations. Note that for the sake of molecular clocks which work based on generational changes, we are only interested in mutations that happen in the germline. In the first scenario a heteroplasmic mother produces a homoplasmic egg due to a mitochondrial bottleneck. Jeanson’s analysis of the data would have counted this as a germline mutation when in fact there has only been the loss of a variant and no mutation has occurred. This second scenario shows a mutation happening in the mother’s somatic line. When comparing sequences taken from lymphocytes, this study would have registered the mother as being heteroplasmic and the daughter as being homoplasmic. Jeanson’s analysis of the data would have counted this as a germline mutation when in fact the germline has remained unchanged. This final scenario shows a mutation happening in the daughter’s somatic line. When comparing sequences taken from lymphocytes, this study would have registered the mother as being homoplasmic and the daughter as being heteroplasmic. Jeanson’s analysis of the data would have counted this as a germline mutation when once again the germline has remained unchanged. Jeanson failed to account for all 3 of these possibilities and instead assumed that if a homoplasmic variant exists in the lymphocyte of a mother then it must also exist in the lymphocyte of her child unless a mutation has occurred in the germline – this couldn’t be more wrong. Mutations can happen in somatic cells and heteroplasmic states can be lost due to bottlenecks. If he wanted to know the generational mutation rate then he should only have been looking at germline mutations. 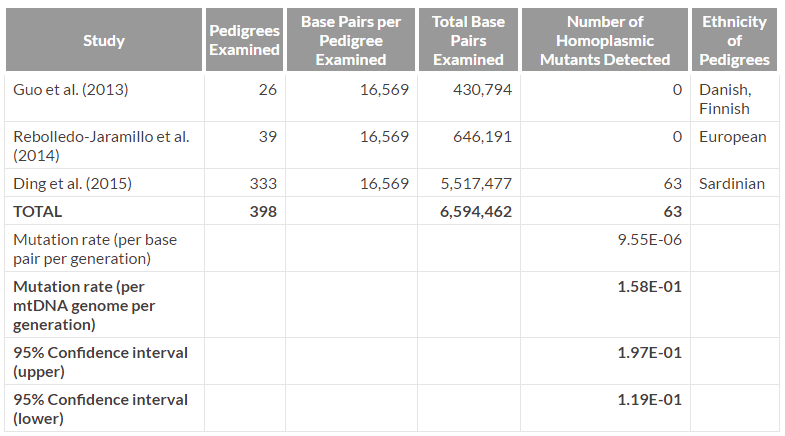 Given known mutation rates and the fact that they looked at 333 pedigrees, I would expect to find about 2 new mutations in germline cells as opposed to 63. The remaining 61 differences would have either happened outside the germline or they would have been the case of heteroplasmic loss due to a bottleneck. What if Jeanson had used the correct mutation rate? So what if, instead of making up his own mutation rate based on cherry picking studies and flawed assumptions, he had consulted the peer reviewed literature for a mutation rate instead? What would that tell us about how distantly related these two individuals are? 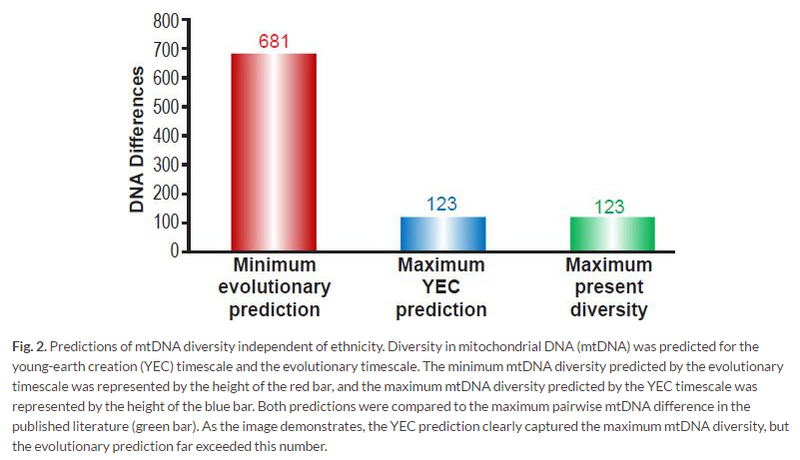 Mitochondrial eve was estimated to live between 99,000 – 234,000 years ago so this mutation count (123) and mutation rate (1.665 × 10−8 substitutions per nucleotide per year) fit with existing data. I’ve recreated Jeanson’s graph based on the published, peer reviewed mutation rate. In order to do so, I’ve made two assumptions: mitochondrial eve lived 230,000 years ago and the biblical eve supposedly lived 6000 years ago. In summary, Jeanson was looking for a mutation rate which needed to be about 35x greater than what has been measured in order to fit his narrative (a story about a global flood wiping out humanity 4000 years ago). He created this mutation rate by cherry picking data from one study and then combining this with null results from two other studies in order to reduce it. The study he took data from was not suited to providing a mutation rate and this is not what the authors of that study were even looking at. Finally he made a number of fatal assumptions with the data from that study which don’t stand up to scrutiny and he accidentally ended up with a mutation rate which just so happened to perfectly match the rate required to prove that humanity was 6000 years old. In fact this video includes a mini interview with Jeanson about one of his recent YEC papers (the one you are discussing I think). Nothing to add here other than to say that this analysis is totally awesome. Thanks for the very clear description of Jeanson’s analytical problems. I assume you were being super sarcastic when you said accidentally. He intentionally skewed the data, because he’s a religious fanatic, and religious fanatics literally have no problem with unethical fuckery if it’s for their religious cause. It certainly looks that way to me – in fact I can’t imagine any other plausible explanation for the fact that he obtained a mutation rate so close to the one required – but I’m not willing to outright accuse him of that until I see more evidence. ALL assumptions are incorrect, in any situation; pointing out that they are “flawed” is redundant. If the facts are on your side you don’t need to write with a slant. I’ve got no idea how to make sense of this comment – clearly some assumptions are correct and some are incorrect and I don’t know what writing with a slant means. In this case his assumptions were wrong – suspiciously wrong. Here is somebody with a PhD from Harvard making a mistake so elementary that it should take an undergrad less than 30 minutes to spot. It almost looks like he did this on purpose. Seems like this commenter was interpreting “assumption” to mean “unverified/unjustified/baseless assumption”. Which sounds like a bad assumption to me, but that’s the only way I can parse it. For those wondering how Jeanson got the mutation count to line up EXACTLY with his YEC “prediction, here is an important statement from his second paper (linked in this article), I’ll elaborate here. It’s pretty despicable if you ask me. So, he got the highest number of differences we see today from Kim and Schuster (2013), who as we know gave a maximum difference of 123. In other words he made a prediction for the max number, the one that came back was short, so he just listed the observed number as the total “prediction” arbitrarily. Granted, it still fell into his total range of numbers. But it’s clear why he did this. It looks better to have an EXACT numerical “prediction”. A small manipulation but a manipulation none the less. I just wanted to point this out because it shows that his “spot on” prediction of mutation count is a manipulation and makes his “prediction” a lot less suprising. It’s safe to say this study was a colossal failure. If you’re interested in writing more about this, I’d be more than happy to host another guest post explaining these issues more fully. It’s a fascinating topic, digging into all the little tricks he’s done to get the results he wants. Sorry for the late reply. I’ve been on vacation. While I appreciate the offer to do a guest post, I must admit I’m not interested in looking into Jeanson article any further. He fudged his mutation rate and his predicted numbers; his work is just garbage. i) The main claim is that my mutation rate is 35x faster than the published one. In fact, if you look at the article the author cites, the “published” rate (Soares et al) is one derived first assuming evolution and millions of years, and then fitting facts to these conclusions. 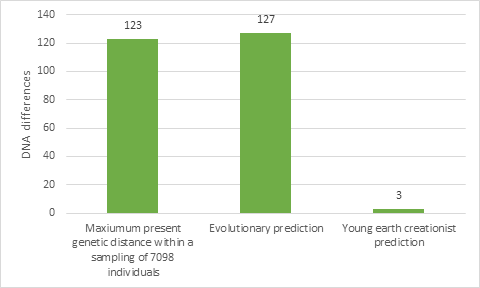 For example, Soares et al first assume an ancient timescale (the very fact that my research contradicts), and then fit DNA differences to this timescale. Not only is this circular reasoning (i.e., assuming evolution to prove evolution), it’s also indirect science. It’s analogous to trying to measure the rate of erosion in the Grand Canyon…by measuring the depth of the Canyon, assigning millions-of-years dates to each layer, and then calculating the rate of erosion…rather than actually physically measuring it. So the main claim of the blog you cited is not a logically sound or scientifically compelling argument against my published work. ii) “By adding null results from small studies like this he could effectively fine tune his mutation rate.” Here, the blog author accuses me of dishonesty. In fact, my goal in citing these additional studies were for the purpose of complete transparency and rigor. I cited all possible studies I could find. If the author of the blog really wanted to accuse me of cherry-picking, the author should have cited many studies I missed (which the author doesn’t do). iii) The author tries to explain away my published mutation rate by invoking three possible scenarios under which my actual mutation rate would drop. The second scenario and third scenarios invoke a similar principle–that I scored somatic mutations rather than germline ones. In theory, this could be a valid objection. But, again, let’s take it to it’s logical conclusion. For example, the author of the blog took for granted that number of mitochondrial DNA differences among the different people groups. But how many of these have been validated as germline changes and not somatic ones? For example, the author has no problem with my citation of 123 differences being the max difference between two humans–but how does the blog author know that these differences are germline ones? Furthermore, the evolutionary mitochondrial Eve and out-of-Africa model is founded on the assumption that mitochondrial differences among ethnic groups are germline. Should this be questioned now as well? If the author of the blog is not careful, he will soon undermine the entire mitochondrial DNA field! But for sake of argument, let’s conservatively say that this germline-somatic dilemma is enough to prevent us from reliably inferring a mutation rate from the Ding study. What does the blog author suggest that we invoke instead? The logically circular rate derived from Soares et al? -If the rate I cited from Ding’s data is invalid, why does it agree with the 7+ studies that have been published previously? (See Table 4 of the following paper, as well as the discussion therein: https://answersingenesis.org/genetics/mitochondrial-dna/recent-functionally-diverse-origin-for-mitochondrial-genes-from-~2700-metazoan-species/) Why is there such strong scientific consistency across multiple independent scientific studies? If the blog author wishes to question the conclusions of the one study he cites, he has a lot more evaluating and explaining to do than the single paper with which he interacts. -Why do mitochondrial DNA clocks point towards a young-earth and reject a millions-of-years timescale for every other species in which the mitochondrial DNA mutation rate has been measured? (See the following: https://answersingenesis.org/noahs-ark/spectacular-confirmation-of-darwins-argument-for-genesis/; https://answersingenesis.org/natural-selection/speciation/on-the-origin-of-eukaryotic-species-genotypic-and-phenotypic-diversity/) Please note: In the fruit fly, roundworm, water flea, and yeast mitochondrial mutation rate studies, the rates were measured in mutation accumulation lines–in other words, over several generations of genealogically-related individuals. Almost by definition, these studies measure germline mutations–not somatic ones. Why do all of these studies agree so strongly? -What testable predictions does the blog author’s model make? This is the gold standard of science–the one to which creationists have been held for years. If the blog author thinks that he has a better answer than what I have published, I challenge him to make scientifically testable predictions from it. For example, from my young-earth creation model, I can predict (i.e., I’m claiming that I can) the mitochondrial mutation rate in the millions of species in which it has yet to be measured. I’m willing to test my predictions in the lab. I challenge the blog author to do the same. Otherwise, by the evolutionists’ own standards, the blog author’s claims pseudoscience. You might have noticed that these three questions that I ask refer to an extensive literature that has already been published on this topic–literature with which the blog author never interacts. You could almost say that the author seems to be cherry-picking which studies to address and which ones to ignore. I’m not saying this to accuse–my actual opinion on the subject is that I presume that he has no idea that this published literature exists. Rather, my point is saying this is to show that the “cherry-picking” stereotype can cut both ways. he seems entirely ignorant of the methodology used in Ding et al of very deep NG sequencing of mitochondrial genomes and even the point of the study. The probability of a substitution in a typical population genetic study being somatic and spreading to such a degree within an individual organism that it represents the dominant site is infinitesimally small. Virtually all mtDNA variation in a typical population genetic study that does not employ the very deep sequencing (>180x) as in Ding et al and their very specific algorithm for variant calling is germline. Jeanson has virtually no idea what he’s talking about and he’s only really seen as credible by those who know even less than he does. You’re not the first to ask this and I’m also curious about a possible response. So I have been trying to get in touch with the author of this post to see what they say. Sadly not having much luck. Thanks for the reply. Let me know if you hear something else. I have a YouTube debate scheduled with Jeanson in September. That sounds fascinating, you must tell me more. In terms of this study, I think it’s just worth noting how the mutation rate he complains about can be objectively tested. There are population divergences in humans of a known age, whose accumulation of mtDNA variation fits with the evolutionary rate of change, not his. Some examples of this are given in the post. I’m going back over and re-reading the supplemental material for the Ding et al. 2015 paper. They explicitly point out mitochondrial bottlenecks and provide evidence that this indeed is what is occurring in most cases. I hope Steve will revisit this excellent critique given Jeanson’s book and the attention on our debate. I’ll have part one of a review of Jeanson’s book on my web page today or tomorrow and part two (covering this material) soon to follow.